As long as I remember, it has been a tradition in my family to have strawberry shortcake on Father’s Day. Not that it was the favorite dessert, but mostly because strawberries were in season. We would pick somewhere between 30-50 quarts, go home, wash, cut, bag and freeze them. Sure, Michigan strawberries may not be big like some other states, but they are the sweetest and most flavorful berries on this earth. So of course dad loved them, they were “sweet like him” he would say. Especially when they were freshly sliced, allowing their sugary juices to escape as they were poured over top of a freshly baked biscuit stuffed with vanilla ice-cream. Final touches of a little whipped cream and then strawberry shortcake dad’s way was ready for him to enjoy. I preferred fresh strawberries over ice-cream, sometimes a shake, or just a bowl of plain fresh strawberries. Still to this day, at least weekly, I will have a peanut butter and jelly sandwich. You guessed it, with homemade strawberry jam. Now that I think about it, I eat strawberries and yogurt a lot, and indulge in an occasional strawberry daiquiri made from the frozen strawberries, rum, and some fresh squeezed lime. Strawberries are so easy to grow. You can grow them in the ground, or even hydroponically. 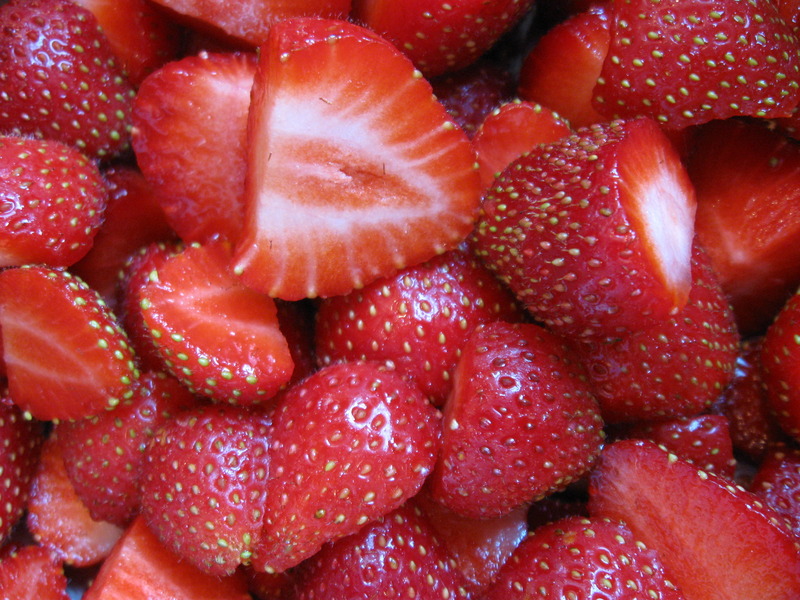 There are June-bearing strawberries, which are strawberries that bear fruit in June or Ever-bearing strawberries, A.K.A. Alpine strawberries, which bear fruit continuously. These are a little smaller in size, but have more flavor. At My Urban Farmscape, I have planted some June bearing strawberries around my blueberries. They will tolerate the lower pH that blueberries need to grow, and it will provide a nice groundcover underneath them. I have both of my favorite fruits growing in raised beds. I am growing Alpine strawberries from seeds, so I won’t have any fruit this year. These do well in containers, especially hanging baskets, which makes a perfect choice for smaller gardens. I have to be quick to harvest, or protect the bed with a fence to prevent squirrels or some other animals from eating them before I get them. Since I love to make strawberry jam, I needed more strawberries than I could grow, so lucky for me that my favorite organic farmer is growing strawberries. I only paid fifty cents more a quart for certified organic. Not bad. I use the recipe that is included with pectin of choice, Sure-Jell or Pamona’s Pectin. Pamona’s can be found at most health food stores or online. I like using this when I want to make a no or low sugar fruit spread, or use honey or maple syrup instead of sugar. If you have never made jam before, I would recommend starting with strawberry. It is so easy! 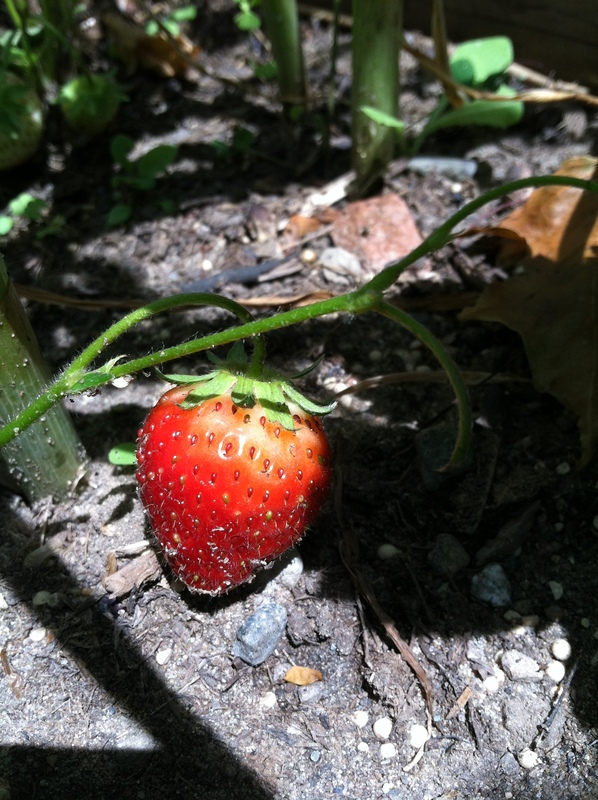 If you’re not growing strawberries in your Urban Farmscape you should start next spring. 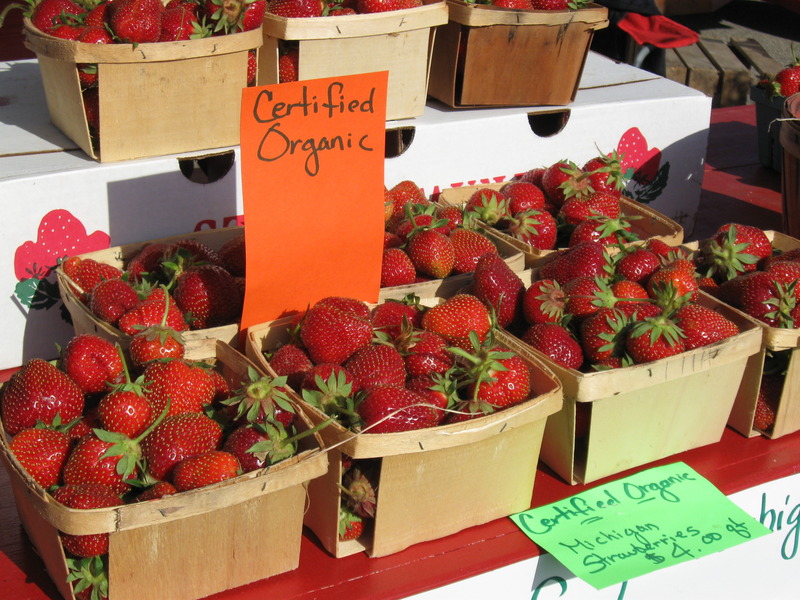 For now, visit your local farmers market for fresh Michigan strawberries, buy extra for jam, or maybe take dad to pick some at the local u-pick strawberry farm. Then when you get home, bake some fresh biscuits, slice some strawberries and allow them to become juicy. Allow the biscuits to cool slightly, but still a little warm so the ice-cream melts just a little. Pour over a generous amount of juicy strawberries, and top with some whipped cream. YUM! Can’t be with dad today? Send him a jar of homemade strawberry jam. One of the sweetest of all Michigan treats. Congrats! I nominated you because I’m intrigued by your blog!